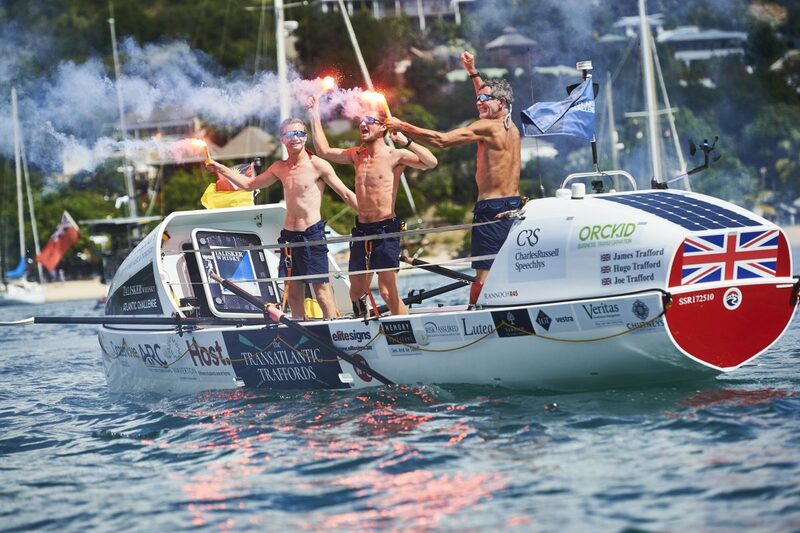 James Trafford, 59, and sons Hugo, 22, and Joe, 19, were gobsmacked when they crossed the finish line of the Talisker Whisky Atlantic Challenge – breaking the speed record for a trio by eight days. The trio completed the 3,000 mile unsupported row in just six weeks in their Rannock R45 rowing boat, and also became the first father and son trio to row an ocean. Working in shifts, the team rowed 18 hours per day – two hours on and one hour off – for 41 consecutive days and encountered whales, dolphins and 40 ft waves across the equator. Youngest crew member Joe, who was just 18 during the race, said it was the ‘greatest adventure of his life’ despite being slapped in the hand with a flying fish while rowing in the middle of the night. The family, from Salisbury in Wiltshire, had initially anticipated the journey taking up to 65 days and said it was ‘never in their plan’ to become the fastest trio in history when they arrived in Antigua on January 22. Hugo, a geography grad from the University of Bristol, said: “It feels absolutely amazing to have not one but two world records when we weren’t there to win or get a world record at all. “We were just a father and sons doing it for a bit of a laugh really but when we realised we were on for a world record, we just couldn’t believe it. Despite their lack of rowing experience, the Traffords are keen sportsmen. Hugo ran the 2016 London Marathon, Joe is a tennis player and dad James, a solicitor, has participated in several offshore sailing competitions. The trio set off from La Gomera in the Canary Islands on December 12 and faced ‘the toughest weather’ on their journey to the West Indies. 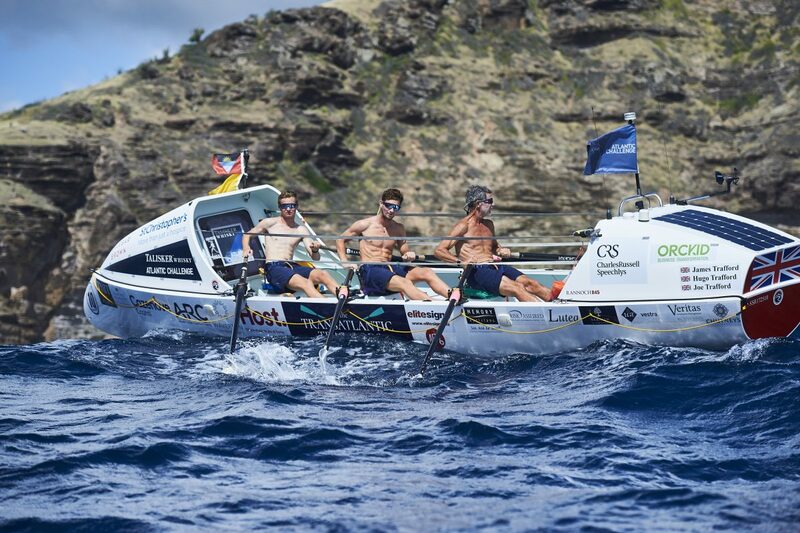 Hugo said: “The winds were blowing in the wrong direction for a few days which meant we were pushed back by 20 miles – which was very demoralising when we had been rowing flat out for days. “Then there were some big seas and strong winds which made the boat tough to live on – we had walls of water smashing into our bodies and our water bottles went flying overboard. “Then there were cargo ships coming up close to us and we had to steer away. The close-knit family worked ‘very well together’ and agreed the wildlife was a highlight of the trip. Hugo said: “We had some tense moments and there was no escaping the boat but we did not end up pushing one another overboard. “We had finn whales within a foot of the boat nearly touching us, dolphins playing at the front and a storm petrel bird that followed us the entire trip. James, Hugo and Joe celebrated Christmas and New Year on the boat before finally stepping off in Antigua at 12.30 last Tuesday, finishing in seventh place. They let off flares as they came into the quay where they were greeted by family and friends and crowds with foghorns. Hugo added: “It all just hits you and it was very emotional to see their faces after all that time out at sea. Dad James collapsed from sheer exhaustion during an interview at the dockside but recovered shortly after. The solicitor, who is popular among A-list celebs and premier league footballers, said: “The adrenaline is what keeps you going – I was in a pretty bad way for a few days after but it was all worth it. “Of course I am incredibly proud of my boys – they did very well to take me across and it’s great to achieve this as a family. “I think it is fair to say I have fairly competitive boys – Hugo would give rousing speeches at the end of each day to keep us motivated. Crew member Joe was the second youngest person to ever row the Atlantic Ocean and celebrated his 19th birthday in Antigua after breaking two world records aged just 18. He said: “This is easily my biggest achievement and I couldn’t quite believe it breaking two world records – I couldn’t have asked for a better birthday present. The trio raised £200,000 for St Christopher’s Hospice and the charity’s global training programme, where dad James is a trustee.